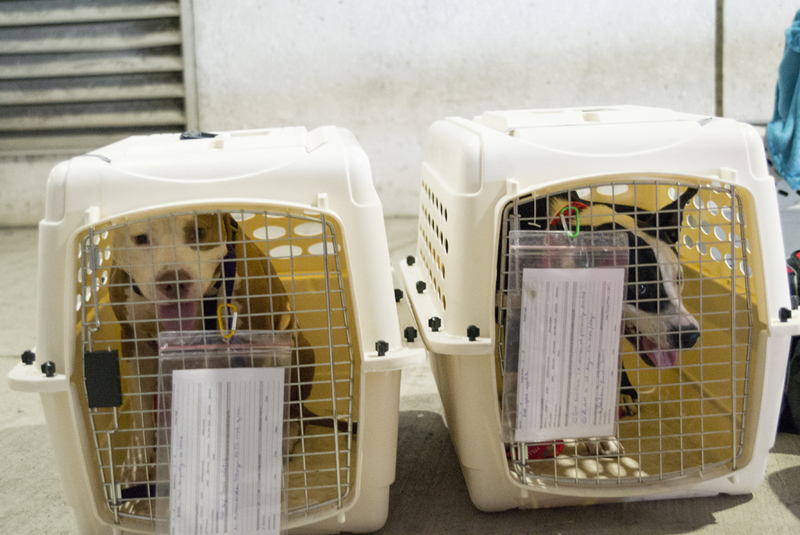 In the critical moments following a natural disaster, the ASPCA’s first priority is rescuing and providing for the immediate care and safety of the animals impacted. But equally important are the moments that come next—the chances we get to reunite displaced pets with their families and see the power of the human-animal bond restored. In the wake of back-to-back hurricanes, we have made heartwarming reunions possible, reminding us all that the work we do affects more than just the animals involved, and that with every tragedy, there is always reason for hope. Miss K.O. (left) and Miss Janet (right) patiently wait to be reunited with their family. Jarvis J. and his family of six were forced to evacuate their home in Grove, Texas as Hurricane Harvey barreled toward the state. To make matters worse, the family was forced to leave behind their beloved pit bull, Miss K.O., along with her two puppies­—Miss Janet and Oakland. Distraught, Jarvis tried to ensure that the dogs were as safe as possible given the circumstances, so he left them untethered so that they could escape to higher ground if the house flooded. As the family took refuge at the Red Cross shelter, they waited for news on their precious pups, and for two days Jarvis began to think the worst. “We had people keeping an eye on them, and they kept telling me they couldn’t see Miss K.O.. They were telling me she was dead. I cried for two days until I could get back,” Jarvis laments. As soon as he was able, Jarvis rented a U-haul truck and headed for his family home. Fortunately, the neighbors had been wrong about Miss K.O., and the four-year-old dog was waiting in the garage when Jarvis arrived. Their home, sadly, had been flooded, but the puppies had found refuge on top of a picnic table in the backyard. All three dogs seemed alright, although Oakland had suffered from what appeared to be a snake bite. Oakland was taken to an emergency veterinary clinic for treatment, while Miss Janet and Miss K.O. were taken into a temporary animal shelter. The shelter had been set up by the SPCA of Texas, staffed by the ASPCA and had been providing care for dozens of displaced pets since the storm. Like Jarvis and his family, many pet owners had to stay in temporary shelters themselves, and visit their pets when they were able. For some, it felt like a lifetime, and reunion day couldn’t come sooner. 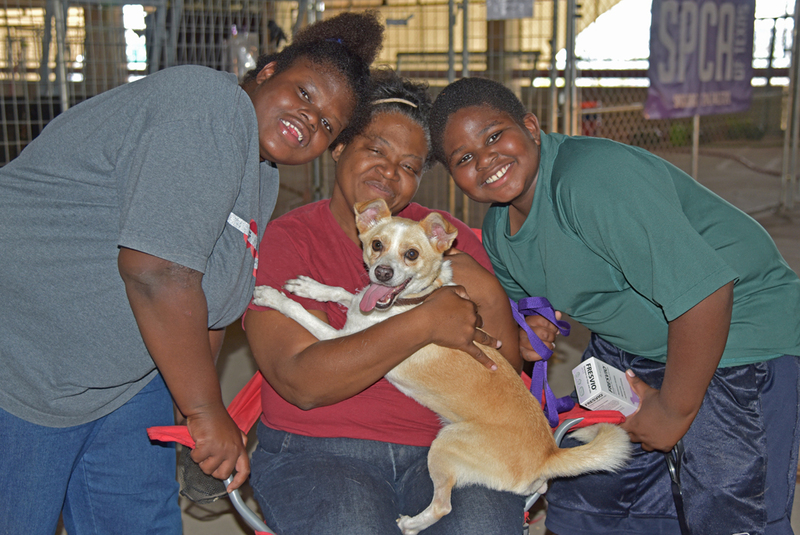 Finally, Jarvis and his family were able to move from the Red Cross to another temporary shelter where they could be reunited with their dogs. The moment the van pulled up, Jarvis and his son were outside, unable to wait any longer to see their dogs. In spite of the tremendous ordeal they have been through, they were all smiles, thrilled to be reunited. Miss K.O. and Miss Janet were just as excited to see their family, as their tails were going wild. Though the family would still have to wait for Oakland’s recovery, and for their home to be deemed safe to return to, this heartfelt reunion was a silver lining for a family that almost lost everything. All smiles as Miss K.O. is reunited with Jarvis. Christa, Shakemia and Christopher with their beloved Pup-Pup. Shakemia J. has experienced her fair share of tragedies over the years. She calls them “storms,” and that was literally the case when Hurricane Harvey upended her life in Houston. “When they told us to go, we left—I didn’t want to be stranded or look back,” says Shakemia, who heeded evacuation warnings and fled with her children, Christopher and Christa, and their 5-year-old mixed-breed dog, Pup-Pup. Once in Dallas, most of Shakemia’s family took refuge at the Kay Bailey Hutchison Convention Center downtown—but not Pup-Pup. The family’s beloved dog was among more than 200 owned pets sheltered in a temporary animal shelter operated by the SPCA of Texas with ASPCA responders on location to help with daily care. Shuttle buses took pet parents to visit their sheltered pets throughout the day, and Shakemia and her kids visited Pup-Pup frequently until they were finally able to reclaim him. Their reunion was filled with tears and laughter. Harvey may not be the last “storm” in Shakemia’s life, but now with Pup-Pup and her family close, she can likely weather whatever comes her way. Reunions like these, and the many more we saw in towns like Sour Lake, Texas couldn’t have happened without help from members and supporters like you. The ASPCA also extends our deepest gratitude toward generous groups including The Elisabeth Lewyt Foundation, Maddie’s Fund and The Rachael Ray Foundation, all of whom made significant contributions to help stretch our relief efforts further than we could have ever imagined. Thank you all for making this possible, and for showing us that community and compassion never fails when needed most.